CHELMSFORD - It was battle number two for the best in the Merrimack Valley, and it did not disappoint. 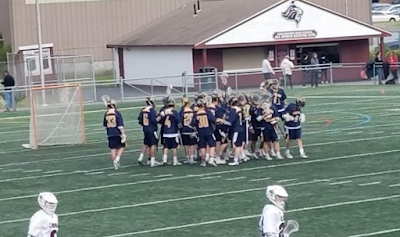 Chelmsford and Andover traded blows throughout, but in the end, it was Andover’s transition offense that took the day and powered the Golden Warriors to a 9-8 win. Down 7-5 late in the third, Andover rattled off the next four goals to go ahead for good. The Warriors pushed the pace on offense, and it paid off with layup goals. Brendan Croston was the biggest beneficiary of Andover’s uptempo attack. The attackman scored two of his three goals in the fourth quarter, wide open on the doorstep, to put the Warriors ahead for good. Croston had the big late goals, but the offensive engine for Andover was Bret Miller. The junior, playing his first game at attack, was compose throughout and asw the field spectacularly from start to finish. Miller finished with four assists, including the helper on Croston’s game winner. Miller also had the first goal of the game. Andover opened up a 5-3 halftime lead, but the Chelmsford defense made things difficult all afternoon. The Lions’ zone hassled Andover, especially on the inside, and the Golden Warriors needed to adjust to it. The Warriors capitalized on transition chances to put pressure on Chelmsford, and the Lions couldn’t answer late. Chris Carver had two goals and two assists for Andover. The Lions had their moment in the third quarter. Chelmsford rattled off four straight goals out of halftime to take a 7-5 lead but couldn’t hold on. The Lions moved the ball well during the run and capitalized on Andover’s turnovers. Jake Green had a hat trick and Christian Gastonguay had a pair of goals for the Lions. Green scored with 1:33 left, and the Lions won the ensuing faceoff before turning the ball over quickly without getting a shot on goal. Andover would successfully kill most of the remaining time to secure the win. Even in defeat, Devin Dunn was stellar in net for the Lions, turning aside eight shots.